Acctivate offers a direct integration to the AvaTax service from Avalara. First, you should read our Avalara Sales Tax Service article. The following instructions are to configure your Avalara AvaTax account information in the Acctivate software. Sign up for the AvaTax service with Avalara. Be sure to let them know that you will be using the Acctivate integration. 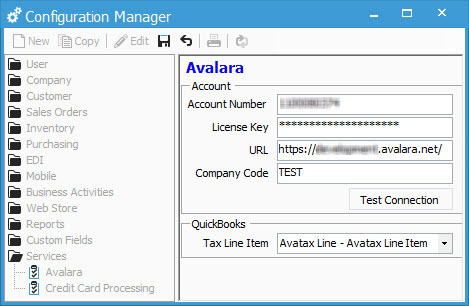 Connect to the AvaTax admin console and navigate to Organization tab. Take note of the Company Code to be used by this Acctivate company. If you cannot find your license key in your email inbox from the initial setup with AvaTax, you can Reset your License Key to receive a new one. Keep in mind, this will break the connection to any other integration you might have until the new license key is put in place across all platforms. Click the Generate button and “The operation completed successfully” should appear as a confirmation. Check for an email in the inbox of your Avalara administrator in your organization. This message will contain the information needed by Acctivate to proceed. Log in to Acctivate as a user with system administrator privileges and open Configuration Management from the File menu. Expand the Services folder in the list on the left and click Avalara. Click Edit on the toolbar, fill in your account information obtained from above. If you’re having issues with the URL sent to you and are in production mode, try https://avatax.avalara.net/ in the setup. Click Test Connection and ensure that the “Test succeeded.” message appears. Click Save on the toolbar once the account information has been tested. Congratulations! You’ve successfully connected Acctivate to your Avalara AvaTax account. Next, you will need to configure your Customers to use AvaTax.